The Golf Villa has been designed with exceptional facilities for family holidays, and enjoys a Mediterranean climate. The villa is an ideal venue year round destination for fun vacations, an intimate country wedding, golf groups, corporate groups or friendly reunions. The ultimate get-away from it all, simply relax and rejuvenate your sole. This is a very romantic place with a lot of panoramic spots, terraces and gardens. The kitchen is close to the terraces and barbecue and next to the swimming pool and the upper garden as well. At the villa you will enjoy fine sunshine, pristine sandy beaches and amazing views that stretch to the edge of the horizon. Situated on the Goose Valley Golf Estate - a magnificent estate that offers a Gary Player designed 72 par, 18-hole golf course in the heart of the Garden Route. The Villa comes fully equipped to international standards. The Villa has 12 beautifully decorated and spacious en-suites bedrooms (including the children rooms) with double doors leading out onto veranda or wooden sun drenched decks and magnificent views. All suites have oversized beds, exquisite linens, huge en-suite bathrooms, 4 LUXURY en-suites opening out onto the veranda, overlooking the garden and beautiful sea views. 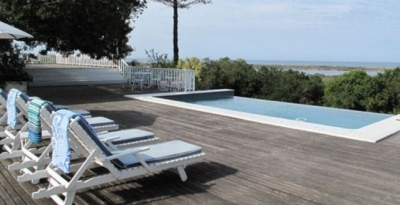 EXTRA Wing A - 2 (+ 2 children) Grand Private en-suites - sleeps 4 couples (+ 4 children) - double doors onto deck and sea views. EXTRA Wing B - 2 Sumptuous Luxury King Size - inter-leading en-suite - double doors opening onto deck and beautiful sea views. THE BUNKROOM has 4 bunk beds + extra bed sleeps 9 children. Entertainment corner and huge en-suite Shower. Entertainer's paradise - generous open plan living - log fireplace, DVD player, TV, Video player, CD player. A large dining table where all can comfortably sit together and dine, high chair available. Fully fitted gourmet kitchen - veggie patch grass and pebbled courtyard. Great Entertainment with sparkling pool with sun drenched decks with spectacular views. Sunny laundry - separate looking onto gardens, Enormous private wooden tea garden set amongst indigenous trees.